What follows is a guest post by Andy Perdue of GreatNorthwestWine.com. While Riesling is not Washington's No. 1 grape - barely - it is the white wine that most defines the state. This is driven by Chateau Ste. Michelle, Washington's oldest winery and the world's single largest producer of Riesling at more than 1 million cases. But Chateau Ste. Michelle is not the only Riesling player in Washington. Hogue Cellars, Pacific Rim Winemakers, Charles Smith, and even Ste. Michelle siblings Columbia Crest and Snoqualmie make significant amounts of Washington Riesling. It should be noted that many of these were from the 2011 vintage, which was down significantly because of a vine-damaging freeze in November 2010. Thus, we can expect 2012 numbers - during which Washington harvested a record 36,700 tons of Riesling - to be significantly higher. 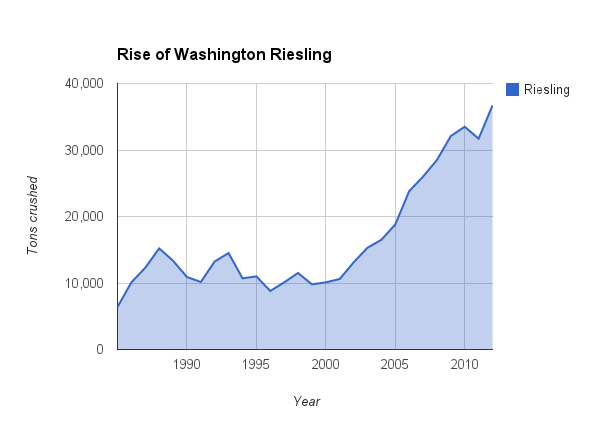 In fact, Washington could top 2 million cases of Riesling from the 2012 vintage. Nicolas Quillé, general manager and head winemaker for Pacific Rim Winemakers near Red Mountain, said he believes that while Riesling growth in Washington has undoubtedly slowed, there still are a number of vineyards that were recovering from the 2011 freeze and were not yet at full capacity last fall. Along with a small number of new plants, he said Washington has a decent chance of reaching 40,000 tons of Riesling within the next one to three years. Ste. Michelle Wine Estates CEO Ted Baseler, when asked if he thought such unprecedented levels could be reached in 2013, replied, "I would say that is ambitious." He should have a pretty good handle on it, since his company has been the driver in growth of Washington Riesling in the past dozen years - and viewed as the leader in America's Riesling renaissance. When Ste. Michelle joined up with Ernest Loosen, one of Germany's top Riesling winemakers, to produce a joint project, many thought $20 for an off-dry American Riesling was a bit crazy. But Eroica caught on with consumers across the nation and helped spur Ste. Michelle to take a deep dive into the global Riesling pool. And, frankly, it caught everyone - including Baseler - by surprise. "Bob Betz had lunch with Ernie Loosen," Baseler recalled. "Ernie talked with such enthusiasm about the vineyards of Washington. We thought it would be a nice project. We didn't envision it as some kind of massive turnaround in the Riesling category." But it did. In 2001, Washington crushed 10,600 tons of Riesling. It was minuscule compared with Chardonnay, which had blown up to nearly three times that. But from that point forward, Riesling production increased precipitously - to the point where it actually surpassed Chardonnay in production in 2009 and 2010. It also led Ste. Michelle to go out and find another Riesling expert in addition to Loosen. So in 2007, it hired Wendy Stuckey, known as one of Australia's finest white winemakers who specializes in Riesling. Suddenly, head winemaker Bob Bertheau was surrounded by talent from the Old World - Loosen - and the New World - Stuckey. Somewhere in between, the three are able to use Washington grapes to produce some of the finest Riesling in the world. This showed at the 2010 Riesling Rendezvous, when a prestigious panel of international Riesling makers and an audience of 300 chose the Ste. Michelle Dry Riesling - which sells for under $10 - as a favorite against stiff and expensive competition from Germany, Alsace, the Finger Lakes and Australia. Even though Washington is producing world-class Rieslings, the state's growers and winemakers still are dialing in their sources. The current favorites for Ste. Michelle are the Yakima Valley and the Ancient Lakes area near George. But we are also seeing great promise in Lake Chelan, Naches Heights and the Columbia Gorge - though none of these areas can currently grow Riesling in great quantities. Andy Perdue, is a wine journalist and author. He launched Wine Press Northwest magazine in 1998 and was its editor through 2012. The Washington native is the editor and publisher of Great Northwest Wine, a news and information company. He is an author and frequently judges in regional, national and international wine competitions. Learn more at GreatNorthwestWine.com. Speaking of CSM, I'm a big fan of the "Waussie" Riesling. It does remind me of a Clare Valley Riesling. Sean, thank you for another excellent report! 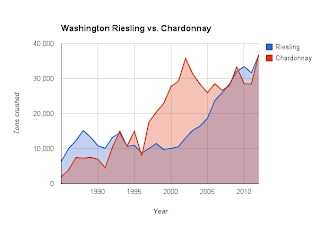 Washington Riesling (in my opinion) is the best value in wine today! We are so fortunate to be enjoying some of the highest quality wines in the world that compliment so many foods. My sincere thanks to all the growers and producers in our state that provide these high quality wines to all of us who appreciate them! Is there any chance Bob Betz might make a Washington riesling? Wow, I'd love to try that! I would guess he would want fruit from a vineyard site similar to those in Mosel: steep, rocky, cool. To my knowledge, all the existing riesling in Washington is instead grown on flat, hot sites with deep soils. As a result, while the wines are OK, they are not even close to the quality of those from Germany. Some how I follow trends without even knowing it. I got hooked on Chateaux Ste Michelle because it had the meter on the back so I could tell just how sweet it was. I've been completely hooked on the reisling for over a year now. In fact, I'm drinking a glass of it right now as I catch up on blog posts. I love it when I'm trendy on accident lol Thanks for some others to try.